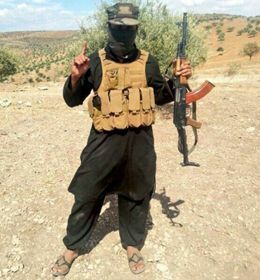 According to the British press, authorities are very close to publicly revealing the identification of the masked executioner in the James Foley and Steven Sotloff videos. Listening to CNN on the car radio earlier today, I heard Senator Chambliss say the same thing, and that they may or may not be the same person. The British killer behind the murders of James Foley and Steven Sotloff was known to MI5 as a low-level collector for genuine Arab charities based in London. It is believed he moved on to gathering funds for Islamic State warlords before deciding to fight for the twisted cause. ISIS has released a video (no link here please) that shows Steven Sotloff in the beheading position. It says he has been executed, and a British hostage, David Cawthorne Haines, will be next. Update: I don't think the video was made at the same time as the Foley video. The executioner mentions the continued bombings "at Amerli, Zumar and the Mosul Dam." Amerli and Zumar hadn't happened when Foley was killed. 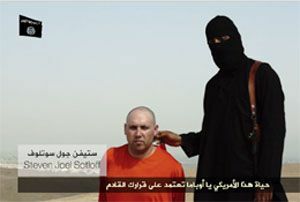 Also, Sotloff had a shaved head and no beard in the Foley video. In today's video, he has hair and a beard.